Funding from the Cumbria Fund fund has enabled Mind in Furness to continue with a project which allows its members to work side-by-side in partnership with National Trust volunteers on conservation projects. Once a month members of Mind in Furness visit High Wray, near Hawkshead, which is the base for the National Trust’s volunteer conservation work. 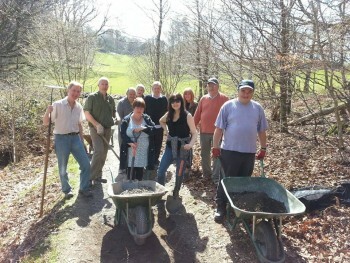 Members have the opportunity to undertake tasks ranging from clearing woods and scrubs, pathway maintenance, dry stone walling, and planting depending on what is most needed. While the National Trust provides conservation staff, specialist equipment and outdoor gear, Mind in Furness provides the transportation and the crucial mental health support. The beneficiaries of the project are twofold. First and foremost, Mind in Furness members enjoy social inclusion in a safe and supported manner, while benefiting from teamwork, physical exercise, confidence building, enhanced motivation and improved mental health. The latter being particularly poignant as the advantages of outdoor physical activity are considerable in connection with mental health. Secondly, the National Trust enjoys an influx of volunteers who can assist in furthering the organisation’s objectives and thus environmental and conservation benefits are delivered to the Lake District National Park. One 56 year old gentleman with mental health issues and learning difficulties attended every session and developed a strong bond with two of the volunteers. He initially lacked confidence, but as a result of the sessions his physical fitness and confidence developed considerably. He thrives in the camaraderie of working in a group with a common objective and has become a valued member of the group. Funding means that this gentleman and many others can be supported in a safe and constructive environment while facing mental health problems.